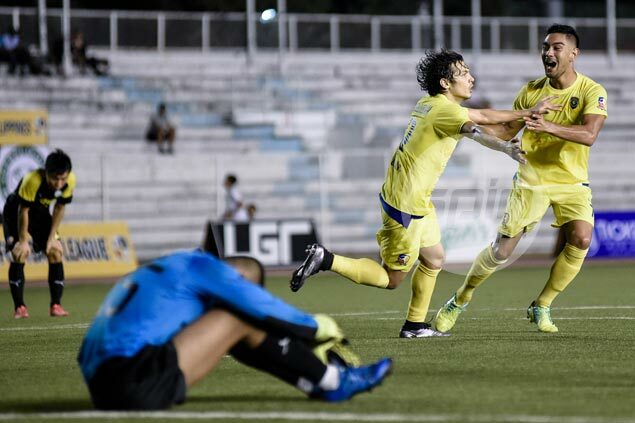 GLOBAL FC earned redemption as it overwhelmed Ceres-La Salle, 3-1, to rule the United Football League Cup on Saturday night at the Rizal Memorial Stadium. The former league and Cup champions banked on an early two-goal lead, before pouncing on a Ceres side in disarray after a controversial non-call in the second half to herald their return to the top after getting suspended in the last Cup due to a player eligibility issue. Misagh Bahadoran struck a brace, while Matt Hartmann added a goal for Global, which clinched a berth in the 2017 Asian Football Confederation Cup after frustrating a squad that’s already making waves in this year’s edition of the second-tier club competition in the continent. “When you finally win something, it feels doubly special,” the Global boss added after his team claimed its first trophy after coming up empty handed last year, likewise its first UFL Cup conquest since 2010, tying Philippine Air Force with two titles. Global pounced on a weary Ceres side that was playing in its third match in two weeks, going two goals ahead in the first 24 minutes of the match, while putting up a resolute defensive stand that frustrated the Busmen. The match, however, was marred by a questionable non-call in the second half when Global left-back Daisuke Sato appeared to have escaped a handball infraction after blocking Patrick Reichelt’s attempt with his hand. With Ceres still arguing, Global capitalized as Bahadoran caught the opponent’s defense napping to strike again and give his team a three-goal lead to eventually be receive the Golden Ball award. A livid Ceres coach Ali Go was sent off after due to continuous complaining, but that motivated Ceres as Nate Burkey pulled a goal back, only to see their comeback fall short. “But they came and you’ve got to tip your hats off to them because we were hanging on a little bit in the middle period of the second half, but we managed to see out the game,” the Scottish mentor added.